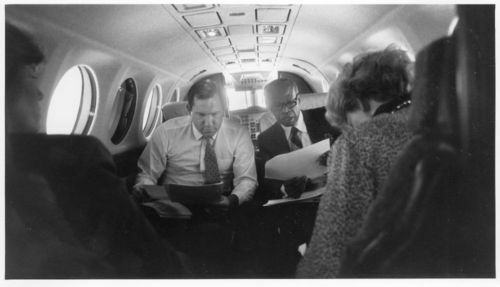 A photograph showing Kansas Governor Mike Hayden with Secretary of Transportation Horace Edwards sitting to his right, and other staff members flying to an event promoting the Comprehensive Highway Plan. Born in Atwood, Kansas, Hayden entered politics after a decorated career in the military where he held multiple offices from 1962 forward. Hayden returned to Kansas after pursuing politics in Washington, D. C. in 2002, as the Secretary of Wildlife and Parks.